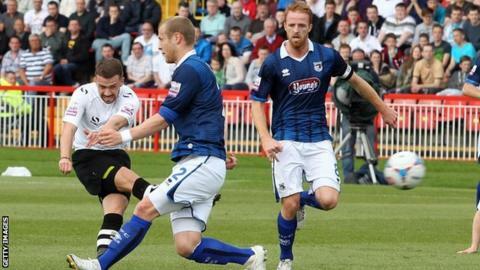 James Marwood scored twice as Gateshead beat nine-man Grimsby Town to reach the Conference Premier play-off final. The hosts led when Marwood's long shot was somehow spilled into his own goal by James McKeown. Town skipper Craig Disley rifled home from 12 yards in between red cards for Scott Neilson and Sam Hatton, who walked for a needless second booking. Gateshead capitalised when Marwood curled home from the corner of the box, JJ O'Donnell adding a late third. The Heed, whose attendance of 8,144 was a club record for a competitive match, are now a game away from ending their 54-year Football League exile. It is another step in a remarkable turnaround for a club, now unbeaten in 14 games, that was mired in a relegation battle when Gary Mills became boss in September. They will now face Cambridge United in what will be their first ever trip to Wembley. Before this season, Gateshead's James Marwood - son of former Hull City, Sheffield Wednesday, Arsenal and England winger Brian - had scored just once in 77 league games for the club. Since Gary Mills became manager in September, the 23-year-old striker has now notched 11 in 37. For Paul Hurst's Grimsby, it was play-off semi-final heartbreak for the second season in a row, after last term's defeat by Newport. In a first half of little goalmouth action, play was largely controlled by the hosts, the best chance fell to midfielder Jamie Chandler, who fired straight at McKeown from 10 yards. But he could not deal with Marwood's speculative effort midway through the opening period, and watched despairingly as it trickled into the corner. Shortly after half-time, Grimsby winger Neilson followed through on Baxter, but his dismissal seemed to spark the visitors into life. After Heed defender James Curtis had a header disallowed for offside soon after a previous effort was hacked off the line, Town poured forward and after a succession of attacks, left-back Aswad Thomas beat Baxter and pulled the ball back for skipper Craig Disley to lash home. With the match seemingly headed for extra-time, Hatton felled Carl Magnay when the full-back was barely beyond the halfway-line, joining Neilson in the dressing room. A moment of brilliance from Marwood settled the tie as veteran playmaker John Oster picked him out on the corner of the box and the 23-year-old cut onto his left foot to bend a beautiful strike into the far top corner. Then, with eight Grimsby players upfield, McKeown came racing out to close down Phil Turnbull, who unselfishly fed substitute O'Donnell to make certain of a trip to Wembley to face Cambridge and trigger a mass pitch invasion. Match ends, Gateshead 3, Grimsby Town 1. Second Half ends, Gateshead 3, Grimsby Town 1. Goal! Gateshead 3, Grimsby Town 1. JJ O'Donnell (Gateshead) left footed shot from outside the box to the centre of the goal. Assisted by Jamie Chandler. James Marwood (Gateshead) is shown the yellow card for a bad foul. Attempt saved. Liam Hatch (Gateshead) right footed shot from the left side of the box is saved. Attempt saved. Jamie Chandler (Gateshead) right footed shot from the right side of the box is saved. Substitution, Grimsby Town. Andy Cook replaces Chris Doig. Goal! Gateshead 2, Grimsby Town 1. James Marwood (Gateshead) left footed shot from the right side of the box to the top left corner. Assisted by John Oster. Attempt saved. Jamie Chandler (Gateshead) header from the right side of the box is saved. Assisted by James Marwood with a cross. Substitution, Grimsby Town. Jamal Fyfield replaces Ross Hannah. Substitution, Grimsby Town. Andi Thanoj replaces Scott Kerr. Attempt missed. Phillip Turnbull (Gateshead) right footed shot from outside the box is too high. Second yellow card to Sam Hatton (Grimsby Town) for a bad foul. Offside, Gateshead. Liam Hatch tries a through ball, but Liam Hatch is caught offside. Sam Hatton (Grimsby Town) is shown the yellow card for a bad foul. Substitution, Gateshead. Liam Hatch replaces Marcus Maddison. Attempt missed. Marcus Maddison (Gateshead) right footed shot from outside the box misses to the right. Substitution, Gateshead. JJ O'Donnell replaces Colin Larkin. Attempt blocked. Phillip Turnbull (Gateshead) left footed shot from outside the box is blocked. Attempt saved. Lenell John-Lewis (Grimsby Town) right footed shot from outside the box is saved. Goal! Gateshead 1, Grimsby Town 1. Craig Disley (Grimsby Town) right footed shot from the centre of the box to the high centre of the goal. Assisted by Aswad Thomas with a cross. Offside, Gateshead. James Curtis tries a through ball, but James Curtis is caught offside. Andrew Boyce (Grimsby Town) is shown the yellow card for a bad foul. Foul by Andrew Boyce (Grimsby Town). Scott Neilson (Grimsby Town) is shown the red card for a bad foul.